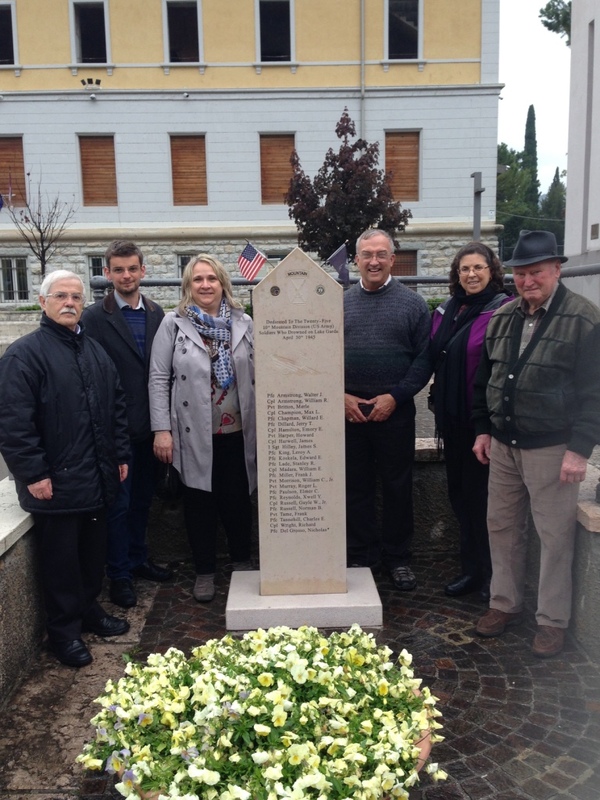 The DUKW monument in Lake Garda commemorating the 25 soldiers lost in the night-time mission on April 30, 1945. As a skier growing up in Colorado, my awareness of the 10th Mountain Division started at a young age. My understanding of who the soldiers actually were and their legacy didn’t really kick in until I was in high school, however. And even then, I was not completely aware of their impact on American history and their role in the skiing boom — or realize my connection to it. It was history, and as a student, I thought history was boring. Right? Wrong! Very wrong! As an adult, it has become my mission to change the perception of this. The generation that sacrificed everything during World War II was, plain and simple, amazing. The soldiers of the 10th Mountain Division did not blog or tweet about their accomplishments. Some kept journals of their war-time adventures but then put them away in trunks that descendants are starting to find. When the soldiers of the 10th Mountain Division returned from the war, they went right back to work or, in some cases, back to school. They helped build a vibrant post-war economy and laid the groundwork for the modern ski industry of today. They were responsible for countless advances, from founding more than 60 ski areas to developing swinging chairlifts to instructing new skiers. They truly were the “Greatest Generation” and our youth should not only learn about who those men are but also respect and learn from what they did. Camp Hale, located between Red Cliff and Leadville, became home to the 10th Mountain Division as it trained for its mission in Europe during the war. I never thought much of it until I co-produced and appeared in a documentary with Colorado Snow Sports Museum and Warren Miller Entertainment called “Climb to Glory.” The documentary film project took me more than six years to move from concept to reality and included the help of a lot of people. To tell you the truth, I was initially just trying to find a unique angle to create a ski segment for the annual Warren Miller film. I still had no idea what the 10th actually did. This changed when I sat down and started interviewing some of the men during a 2008 reunion at Ski Cooper, which is the ski area built for them in 1942 to facilitate their training. Ironically, it was after the interviews that I actually started to research exactly who these men were and what they did. And the stories are mind-boggling. This initial research and project just opened up a treasure chest of information and stories. With “Climb to Glory,” I have talked about the legend of the 10th Mountain Division in person to more than 100,000 people during screenings and other presentations. Indirectly, it’s millions. A majority of the stories I have shared have been to kids through my Youth Project. It quickly became clear that the 10th Mountain Division’s story presented through the film inspired the youngest of ears to perk up. It’s also why I am working on a second, nonprofit educational documentary. This passion for researching the tracks of the 10th Mountain Division has had another positive impact on my life: It has put me in the crosshairs for receiving information about the legendary light-infantry unit from all sorts of resources. Recently, a gentleman in Italy informed me of a research mission taking place while I was there this summer visiting Riva Ridge and Mt. Belvedere. Unfortunately, when the research project went into full swing, I was just getting on a plane to head back home to Colorado. The location of the research was focused on Northern Italy, where the 10th Mountain Division was stationed for one of its final missions before Germany surrendered on May 7, 1945. On April 30, 1945, an American amphibious craft known commonly as a DUKW left the little town of Torbole, Italy, on the northwestern shore of Lake Garda. It was part of a convoy of DUKWs traveling under the cover of darkness to the town of Gargnano. The Mission: At 1:30 a.m. on April 30, 1945, Lt. Gene Hames and about 200 men of the 85th Infantry Regiment packed themselves into six DUKWs to cross Lake Garda. Part of the mission was to take Villa Feltrinelli — where Benito Mussolini had been housed since the fall of 1943 after he was sent there after the Italian capitulation. Villa Feltrinelli is in the town of Gargnano. Allied forces knew that Mussolini had been there but did not know if he was there or not. Germans had all the roads leading into and out of the town completely covered. They were also on the side of the lake firing 88-mm guns across the lake at 10th troops trying to work their way to Gargnano through tunnels. The 10th Mountain troops did not know how many Germans there were, but knew they had to evict them in order to move the American troops further north. Hames and company took the Villa and cleared the town. During the lake crossing, one of DUKW’s engines quit and a sudden violent storm whipped up large waves, causing the DUKW to sink. Twenty-five on board perished; the only survivor of the fateful night was Cpl. Thomas Hough, a former lifeguard from Dayton, Ohio. After years of searching for the location of the sunken DUKW, it was discovered. A local volunteer group called Gruppo Volontari del Garda completed 17 sonar outings, covering an area of more than 7 million square meters of Lake Garda — Italy’s largest lake. Eventually, the local volunteer group located what potentially was the resting spot the amphibious vehicle — which had carried 26 men, a 75-mm howitzer gun and ammunition — at the depth of 276 meters. In October 2018, a team from ProMare, a nonprofit underwater archaeology foundation, led by Brett Phanuef and Fredrik Soreide (two of the founders of ProMare) took a three-man mini-submarine to the location and documented the underwater resting place of the DUKW. Below, you can watch a video of a wreath ceremony in 2015 honoring the 25 soldiers who lost their lives that night on Lake Garda. Longtime Vail Valley resident Chris Anthony has appeared in 28 Warren Miller films.